All are welcome to our Community Christmas Concert of songs, carols and readings, at Chard Guildhall on Sunday 23 December at 6.30pm. Entry is free; there will be an opportunity to donate to the Mayor’s charities. 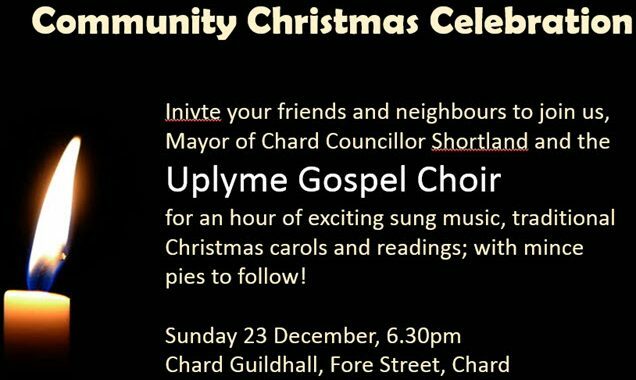 The singing will be led by Uplyme Gospel Choir, whose last visit to Chard was a triumph. A special orchestra will help us lift the roof during the community carol singing, and mince pies will send us home refreshed for the rest of the Christmas season. You don’t need tickets, but we recommend getting there early!